Is Real Estate Headed For Another Plunge? Recent data suggests much lower-than-expected sales activity, at a time when homes should be flying off the market. Traditionally, the summer months are the peak time of year for home sales. With children off from school, it's easier for families to house hunt, pack up, and move, without disrupting their lives too much. In fact, about 50% of all home sales occur during the summer months, according to Realtor.com. If this is the case, than why are sales of new homes plummeting? Inventories of new houses are up, but sales are dropping at double-digit percentages from the same time last year. Maybe the real estate market recovered too far, too fast, and now it's due for a pullback. Home sales are down pretty much across the board. New home sales suffered the worst, with sales down 8.1% from May's numbers, and far off from what economists had expected. In June, new homes sold at an annual pace of about 406,000, or more than 15% less than the 480,000 pace that was expected. While new home sales are a relatively small part of the market, the bad news doesn't stop there. Pending home sales, which are an excellent short-term forward indicator, fell 1.1% in June and are 7.3% less than they were a year ago. In other words, just as the summer heats up, sales are actually falling. This should be very disturbing news for real estate professionals as we head in to the "peak" selling season. And finally, mortgage applications dropped 2.2% in last week alone. While a lot of this is due to a drop in refinancing activity, mortgage applications to purchase homes barely moved, rising just 0.2%. This is simply an anemic pace for this time of year, especially considering the damper put on sales activity by the harsher-than-normal winter. So, where have the buyers gone? Why is this summer not seeing the selling activity you might expect? Well, for starters, houses are a lot more expensive this year. 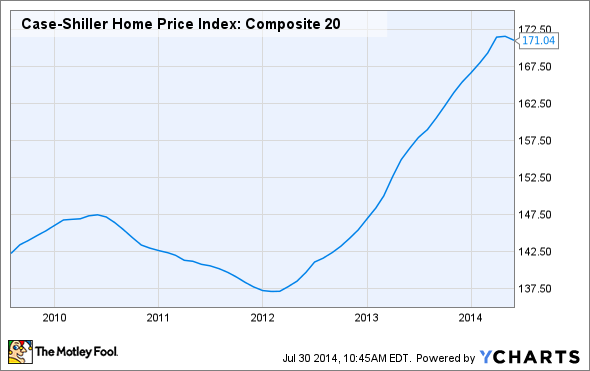 Since hitting bottom in early 2012, the average home value in the U.S. has increased by 27%. And just since last year at this time, home values have risen by nearly 9%. While homes have gotten much more expensive since the financial crisis, people aren't making a whole lot more money. The latest data shows just 2% wage growth over the past year, virtually identical with the rate of inflation. And the rate has been stuck between 1.5% and 2.25% since the end of the crisis. The combination of higher prices and slow wage growth has simply made homes much less affordable to millions of people. To make matters worse, credit standards are still very tight. While the average credit score for an approved purchase mortgage has actually come down a bit over the past few years, it's still high at 755, which is well within the realm of "excellent" credit. And, tight credit is more than just a matter of credit scoring. It means tougher scrutiny over the buyer's ability to repay. With home prices rising, buyers need higher income to justify their mortgages to the banks, or must be willing to accept less "house". The only real potential beneficiaries of slower-than-expected housing activity. Basically, it shifts the power from the sellers to the buyers, especially after the summer selling season ends. Recent data indicates much lower demand for houses in every price range below $1 million, and especially in the lower ranges. For instance, sales of sub-$100,000 homes have fallen by nearly 15% year-over-year, and for homes priced between $100,000 and $250,000, sales have dropped nearly 7%. So, if you're thinking of buying a home, you may get an excellent opportunity, especially if the rest of the summer sales activity continues to be disappointing. It's starting to look like the U.S. housing market heated up too quickly, and is setting itself up for a correction in the near future.